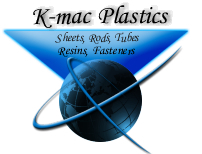 Thermoset Plastic Laminates are uniformly dense and structurally strong material that will not soften appreciably under the reapplication of heat. It is an extremely durable plastic that is lightweight and moisture resistant. 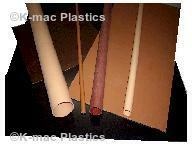 Industrial laminates are thermoset resin impregnated reinforcing materials (paper, cotton fabric, glass fabric, etc.) that are cured under heat and pressure to form solid shapes having high mechanical and electrical insulating properties. 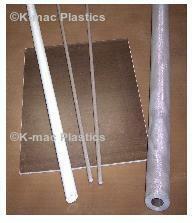 Laminates are available in sheet, rod, tube, and angle. Since laminates are comprised of a combination of materials, they are also referred to as composites. This grade is similar to G10/FR4, with the addition of a higher operating temperature and some improved mechanical strength at elevated temperatures. This grade is composed of a continuous glass woven cloth base impregnated with a melamine resin binder. Melamines are the hardest of all laminates, exhibiting good dimensional stability and arc resistance. It is also caustic resistant. Composed of a continuous glass woven cloth base impregnated with a silicone resin binder,this grade has excellent heat and arc resistance. It has extremely good dielectric loss properties under dry conditions and good electrical properties under humid conditions, although the percentage of change is high. 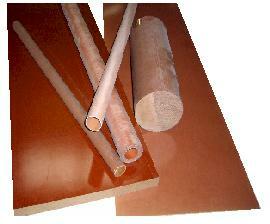 This grade is composed of a paper base impregnated with a phenolic resin binder. It has good electric strength properties with fair mechanical strength. Outstanding for use as template material and or backup material. This grade is composed of a continuous cotton woven cloth impregnated with a phenolic resin binder. This grade contains a fine weave linen and, like the canvas phenolic, is known for it's mechanical properties. The finer weave allows for machining more intricate details than Canvas, like gear teeth. This grade is not recommended for primary insulation.